Be the first to share your favorite memory, photo or story of Cornelius. This memorial page is dedicated for family, friends and future generations to celebrate the life of their loved one. 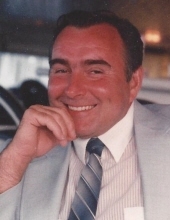 Cornelius J. Cotter, 73, a 52-year resident of Hyde Park, died on Tuesday, December 4th, 2018, at Vassar Brothers Medical Center in Poughkeepsie, New York. Born on January 28, 1945 in Queens, NY, he was the son of the late Cornelius Cotter and Edna Yeaple Cotter. He proudly served in the United States Air Force from 1966 to 1972 during the Vietnam War, receiving many citations and awards. On January 19, 1980, in Hyde Park, NY, he married the Marguerite Cividanes. Mrs. Cotter survives at home. Cornelius owned and operated Neil Cotter Electric for over 20 years. Mr. Cotter was a member of the B.P.O.E. Lodge # 275, Poughkeepsie, the American Legion Post #1302, and the Crum Elbow Gun Club, and was a volunteer in the Roosevelt Fire Department where he reached the rank of Lieutenant, and studied as a member of the Francisca Friars, TOR, Holidaysburg, PA. An avid hunter Cornelius loved the outdoors and enjoyed sitting and talking with friends over a drink. Along with his wife of 38 years he is survived by his two children Jarret Cotter, of Flordia; Dayna Cotter of Georgia; niece, Debbie Bornkamp and her husband, Joseph Bornkamp; great niece, Leanna Borkamp, niece, Tina Wolfman; nephews Richard and Steven Cividanes; sister in law; Christine Wolfman; and brother in law, Gerard Cividanes. Along with his parents he was predeceased by his sister Patricia Manley; and brother, Alan Cotter. In keeping with his wish cremation has taken place. The family will receive friends and relatives from 1pm to 4pm, Saturday December 8th, at Sweet’s Funeral Home, Rte. 9 Hyde Park, NY 12538. Military honors will take place at the end of calling hours. Cornelius's family respectfully requests memorial donations to the Disabled American Veterans, 344 W Genesee St, Syracuse, NY, www.dav.org. Arrangements are under the direction of Sweet's Funeral Home, Inc., Rte. 9, Hyde Park. To send an online condolence, or for directions, please visit www.sweetsfuneralhome.com. To plant a tree in memory of Cornelius Cotter, please visit our Tribute Store. "Email Address" would like to share the life celebration of Cornelius Cotter. Click on the "link" to go to share a favorite memory or leave a condolence message for the family.